Birthday boy Brian loves music. Not only does he sing, he also plays the bassoon, piano and piano accordion. So for his 70th birthday, I needed to make a cake that showed Brian’s passions. A first for me, I’ve never made a bassoon from fondant before. What fun. Here’s to Brian, our very own music man. I’m sure his special day will be filled with laughter, music and song. I’ve known Trevor for many years and have had many discussions about jazz and music with him. Trevor plays tenor saxophone for his band, The Trevor Clefs. He’s one talented guy! So I was delighted that his daughter asked me to make him a cake for his 80th birthday. Trevor is involved in all manner of things: he helps out at church, volunteers at the local museum, loves theatre and music. He was a radio announcer and hosted a jazz show and a morning show. 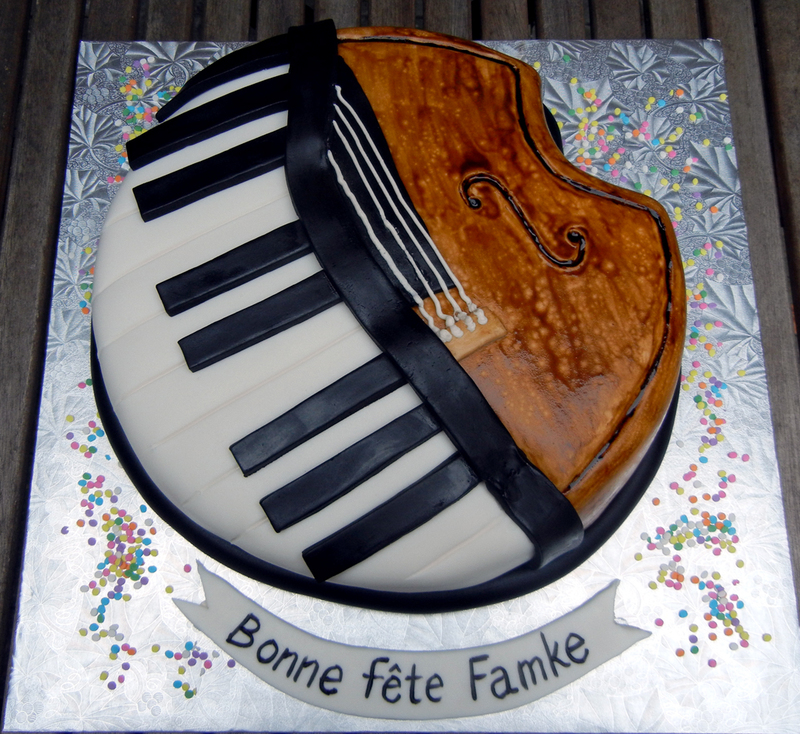 But his love of the sax and jazz was my focus for the cake. The sax on the cake is fondant painted in gold. I tried to make the lettering look like jazz. Confetti and squiggles helped make the sound visual, I think. Happy birthday Trevor and keep blowing your horn for many years to come. This funky little electric guitar was for Marc’s 50th birthday. I used all sorts of candy for the frets and other guitar parts. His wife requested I used two of his faves: Kit Kat chocolate bars and chocolate covered coffee beans. Done! I also used chocolate mint sticks, jujubes and a Lifesaver. Marc loved it and I know he’ll rock his 50s! My friend Terry is a funky bluesman who has an affinity for wearing leopard print shirts. When I was asked to do his birthday cake, I figured why not do an electric guitar cake with a leopard vibe? Perfect! And on the night of his birthday party, he was wearing leopard. Score! This carrot cake fed 40 party-goers for “baby” Adam’s birthday. Apparently the rock ‘n’ roll drummer was turning 30. Hope his party rocked! 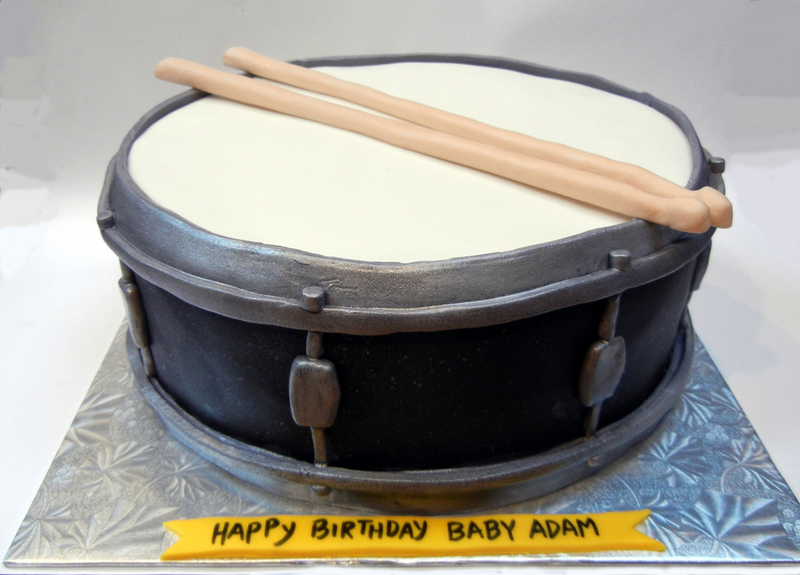 Author ronna2012Posted on October 31, 2015 December 8, 2016 Categories birthday, musical instrumentTags drumLeave a comment on Drum roll, please! This cake was for a sweet little girl whose party had a music theme. Famke, at age five, has just taken up the cello. Who knows? Maybe the piano is next. I made this cake for a friend who collects Fender amps. 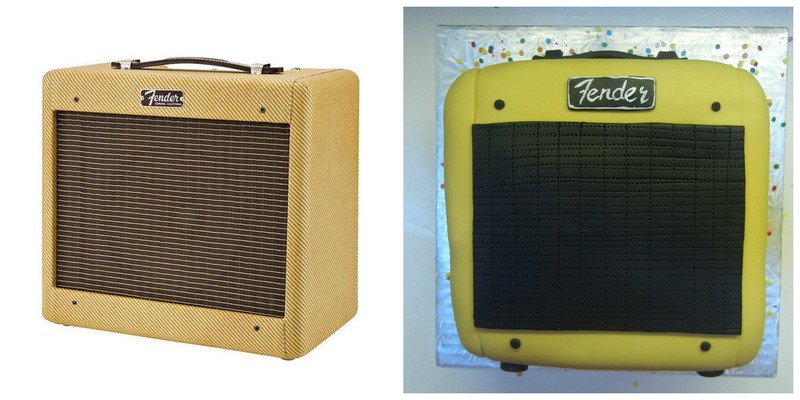 He was turning 40 and his wife asked me to make this amp to go along with the electric guitar cake I also made. What fun!